Click here to see a beautiful, nearly 360 degree panorama of the beach! When is the best time to go to the beach? The best time to go SWIMMING is from the beginning of June through the end of August, when the water temperature is in the 70ºscool, clear and refreshing. In May and September, water temperature is in the 60º rangebrisk and invigorating for a short dip. From October through April, water temperature is in the 50ºs or lowertime to put away the bathing suit. The best time to go WALKING is at dawn or at dusk, or during the morning or afternoon. 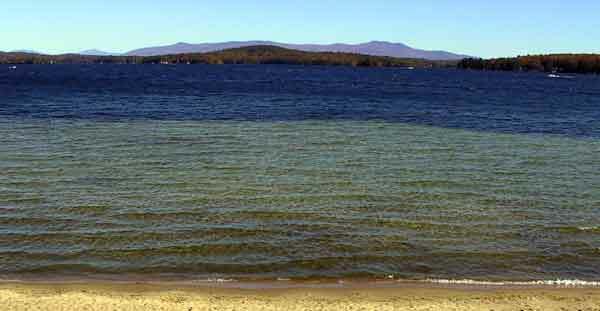 At dawn, the sun rises over the Ossipee Mountains, showering the beach in golden light. At dusk, the setting sun illuminates the Ossipee Mountain range in hues of amber and ochre. 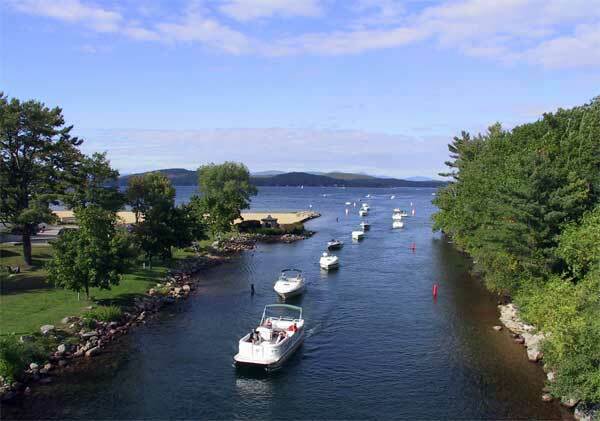 During the morning or afternoon, you should continue your walk to the stone bridge over the Weirs channel, from where you can observe the beach, the boat traffic below and the beautiful mountains in the distance. 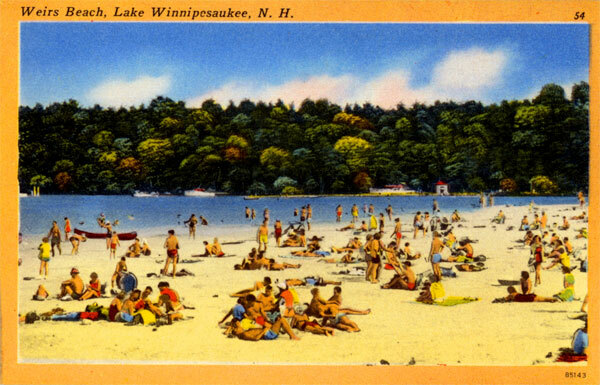 Click here to see a large version of the above linen postcard from the early 1950's. 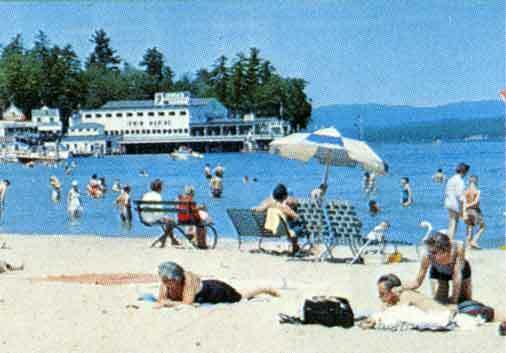 Another beautiful beach scene, showing the Mount departing Weirs Beach. Click here to enlarge. 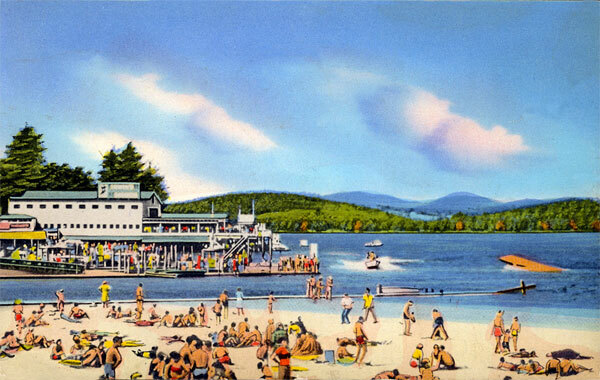 Another linen postcard of Weirs Beach from the early 1950's. 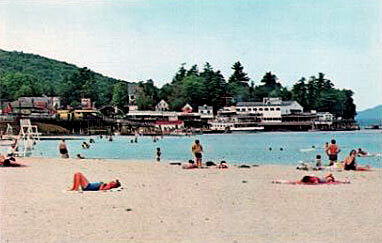 Click here to enlarge and for another early 1950's view of the beach. 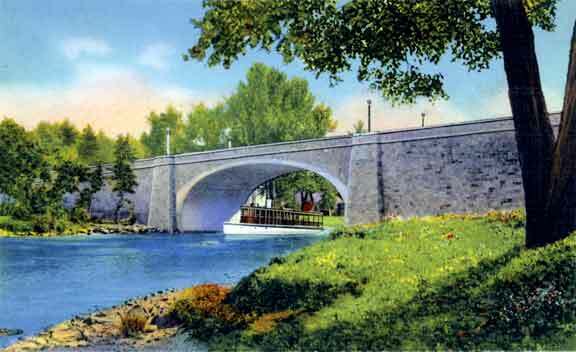 In the 1933 postcard below, the U.S. mailboat Marshall Foch passes underneath the Aquedoctan stone bridge, built at a cost of about $80,000. 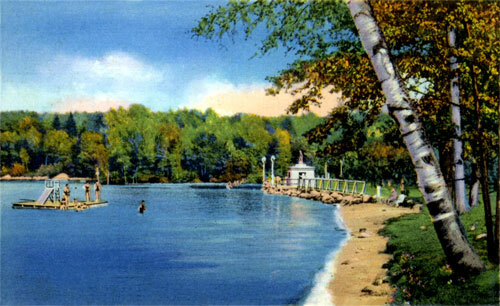 Endicott Rock park was expanded in 1938 by partially filling in the Weirs Channel up to the Endicott Rock monument, at which time the 1901 steel footbridge to the monument was removed. 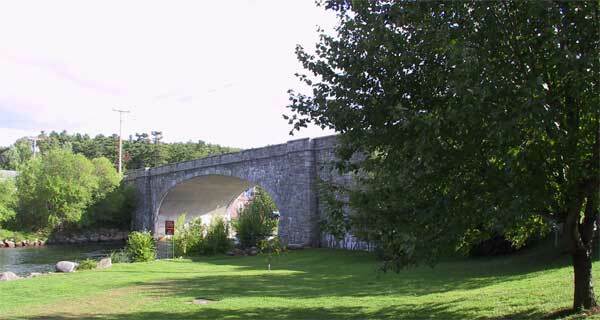 The first bridge to cross the Weirs Channel was built in 1804 and was made of wood. Several more wooden bridges were built, including the covered bridge pictured below, before 1883. 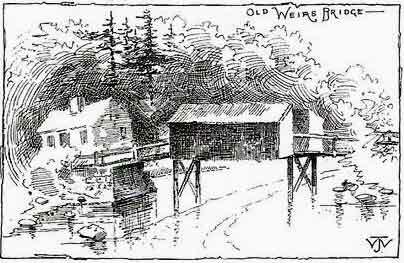 Click here to see a rare, stereoview photograph of the covered wooden bridge over the Weirs Channel, presumably the same one as was drawn in the illustration on the left. 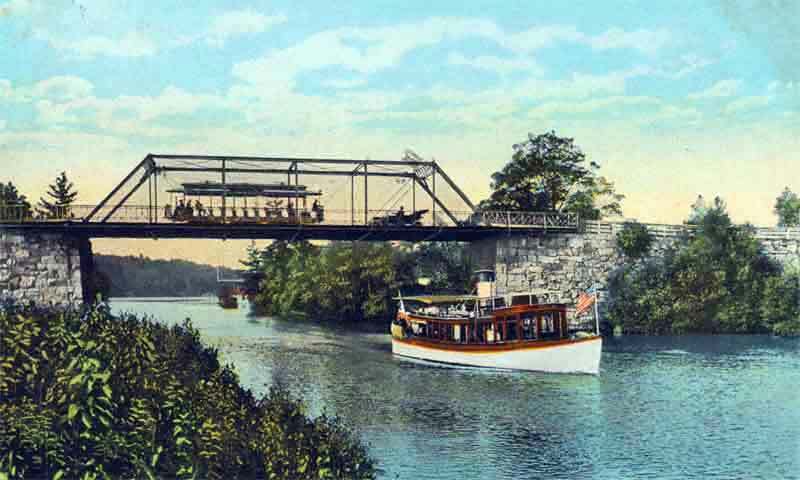 This steel truss suspension bridge was built over the Weirs Channel in 1883, at a cost of about $2000; but it was not built strong enough for the Laconia Street Railway trolley cars; and so it was replaced by the steel structure on the left in 1899. 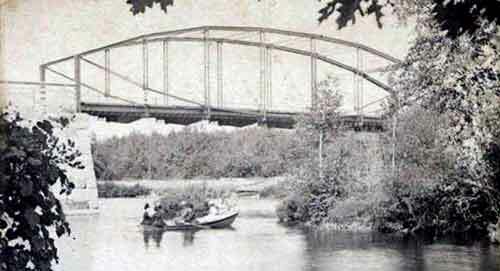 This steel truss suspension bridge (built in 1899) over the Weirs Channel carried electric trolley cars from Laconia to Weirs Beach until 1925. 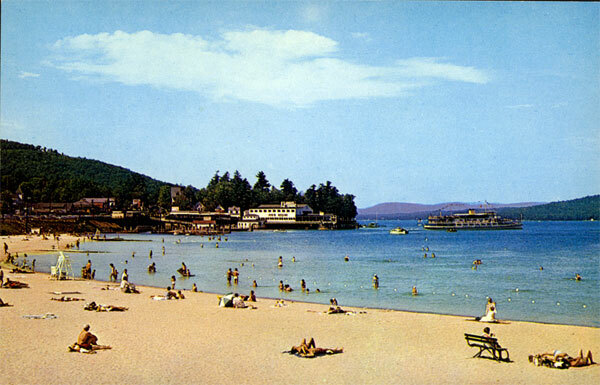 The Laconia Street Railway open-air trolley heads north to Weirs Beach, while an early automobile heads south. The U.S. mailboat Uncle Sam passes underneath. Click here for a larger view. 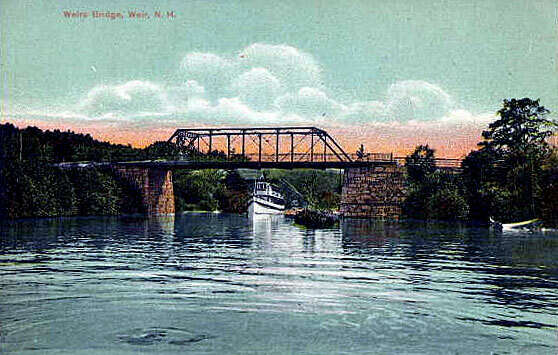 Another early 1900's view of the 1899 bridge shows how wide the Weirs Channel was at the time. The best time to bring CHILDREN is when the beach is officially openand attended by a lifeguard. When the beach and bathhouse are open, the hours are from 10am-5pm. There is a playground near the Endicott Rock monument, and swings near the bathhouse. 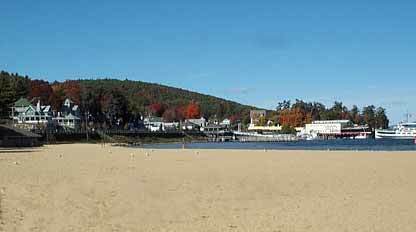 Call the Laconia Parks and Recreation department at (603) 524-5046 for the dates the beach officially opens and closes for the season. 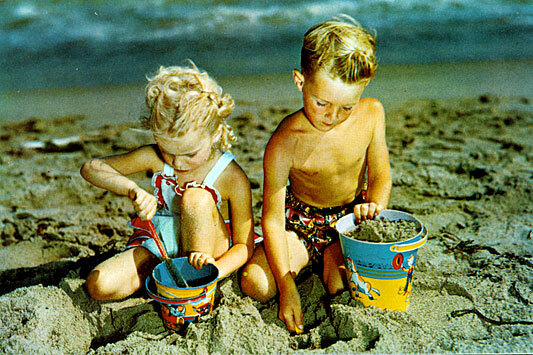 How old is the beach, and how has it changed over the years? But the word "Beach" could not be added until there actually was a beach. 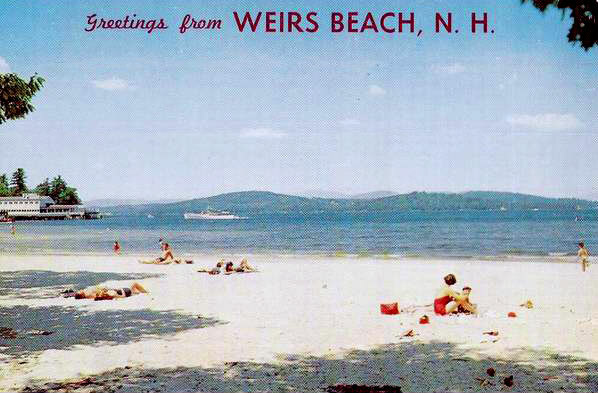 Prior to the 1950's, there was no beach at Weirs Beach. 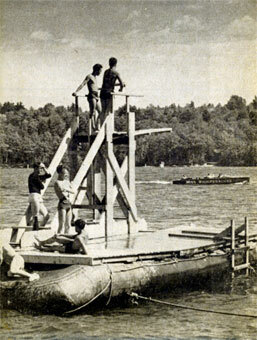 Bathers swam off the rocky shores of Endicott Park to a diving raft. 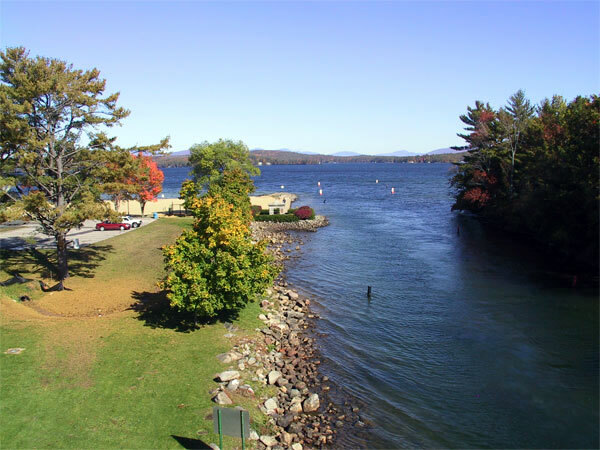 Swimmers contemplate a dive from the raft while the Miss Winnipesaukee speedboat passes by. 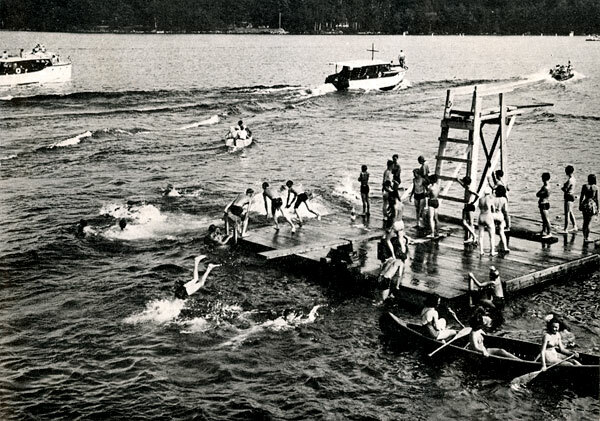 The diving raft was built by the Weirs Business People's Association during the last week of July in 1930 and was an integral part of the fun at Weirs Beach for the next two decades. Click here to enlarge this 1940's photo and the one below. 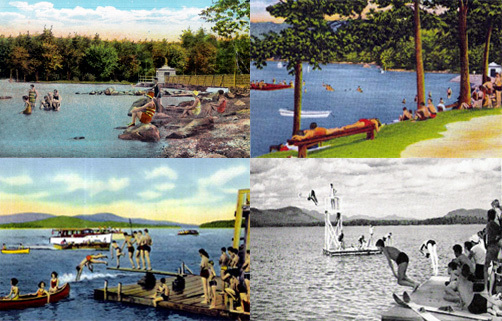 Click on each photo (left) to see the corresponding photo post on winnipesaukee.com. 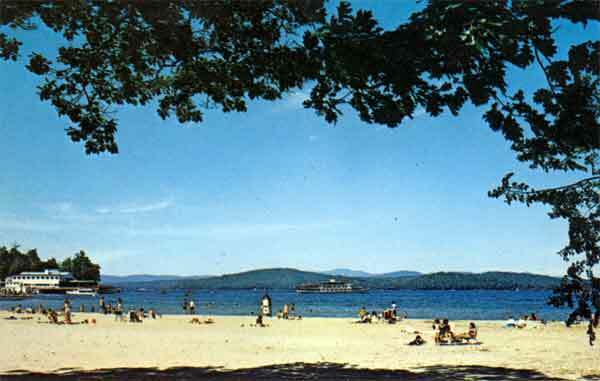 The short and narrow strip of sand seen here was known as the Weirs Bathing Beach and was added around 1930. This was a big improvement over the previous, completely rocky shore, but nothing like today's big, beautiful beach. Click here to enlarge the above postcard. 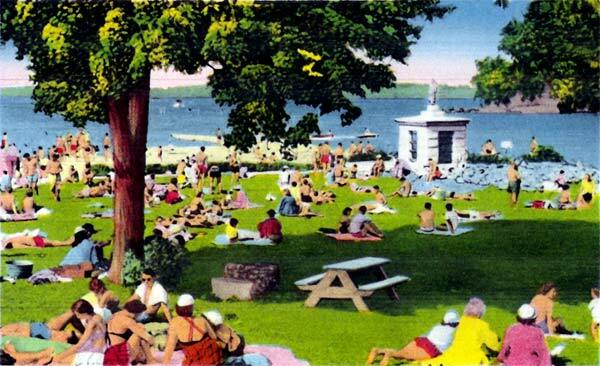 Bathing at Endicott Rock Park - click here to enlarge the above postcard. Back then, people didn't go swimming  they went "bathing". 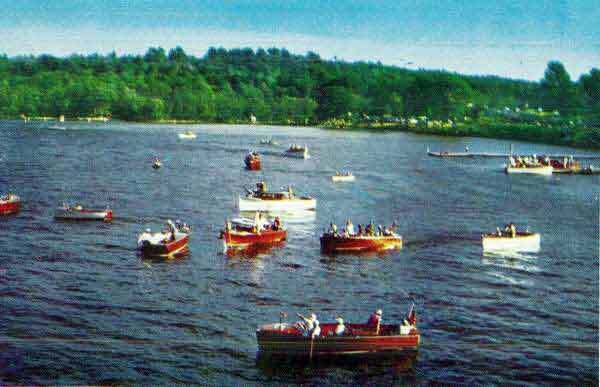 Wooden boats congregate near the Weirs Beach public docks late 1940's  notice the shoreline off in the distance  there's no Beach! 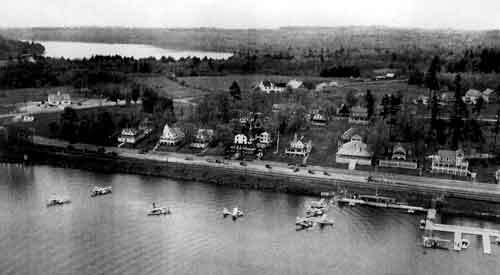 Seaplanes congregate near the Weirs Beach public docks in the late 1940's  notice the shoreline  there's no Beach! Click here to enlarge. 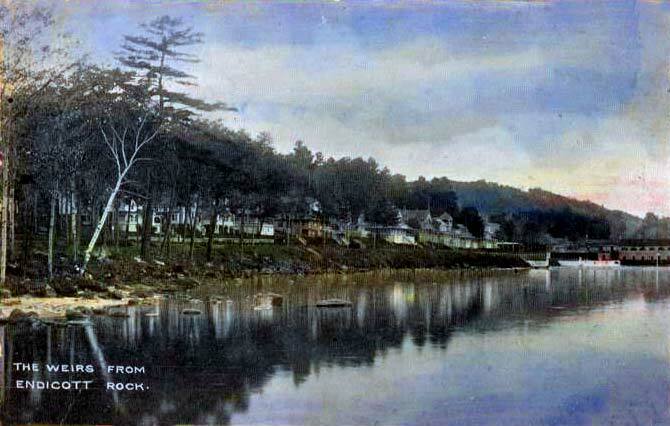 Here's what the shoreline looked like around 1905. 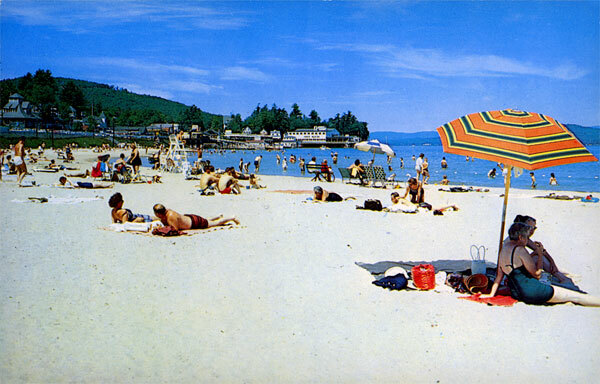 It was during the 1949-1951 administration of Laconia Mayor Thomas J. McIntyre (a Democrat, he was later elected Senator, and served NH from November 7, 1962 - January 3, 1979) that the beach was created. 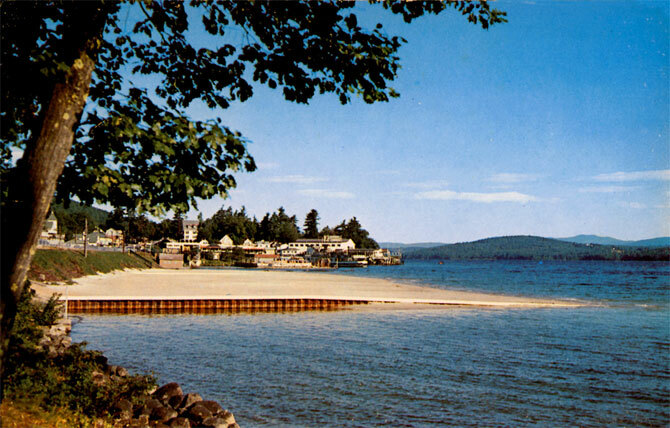 Starting in 1950, and continuing off and on until the early 60's, truckload after truckload of sand  some dredged from the Lake (the Army Corps of Engineers was dredging the Weirs Channel to deepen it at the time), and some from the nearby town of Gilford  was brought in to build the beach. At the same time, three long breakwater jetties were built to retain the sand. Two jetties divided the central part of the beach, and the third jetty along the Weirs Channel kept the sand from washing away down the channel. Only 8 years after its initial construction, erosion had already taken its toll. 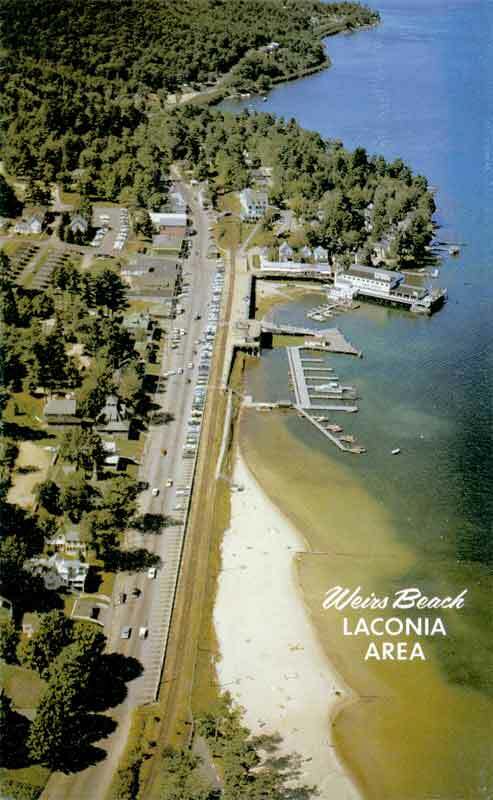 A May 1958 Laconia Citizen article noted that work was about to start on a project to reclaim "about 2,000 cubic yards of sand which have washed away from Endicott Beach at The Weirs." 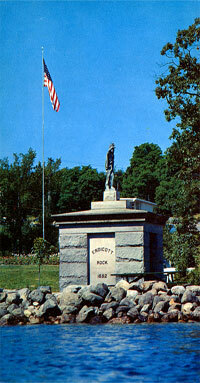 Various views of the Endicott Rock monument circa 1960. 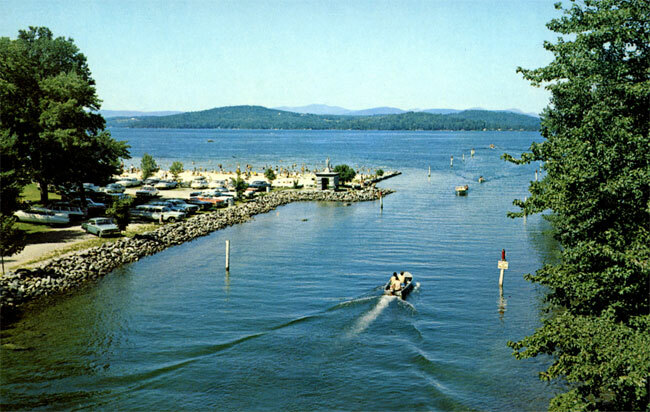 Click here to enlarge the above view of the Weirs Channel and for a similar view from circa 1950, before the beach; as well as to enlarge the photo on the left. 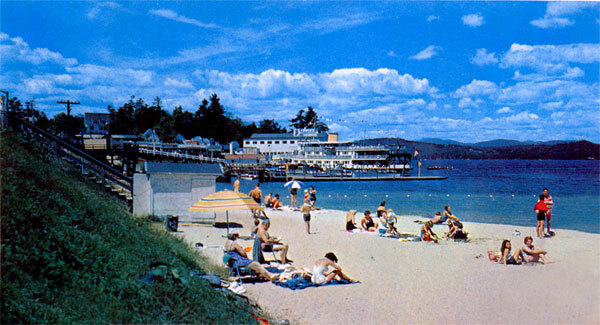 Note the prominent jetty in this beach photo (above) from the mid-1960's. Click here to enlarge the above photo. In the circa 1961 aerial photo below (click here to enlarge), the two central jetties have effectly divided the beach into a three-part "wave". 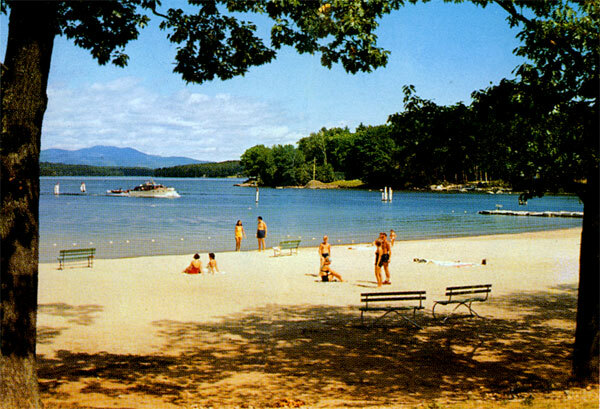 Endicott Rock Park is open from 8:30am until midnight. Parking costs $10 for cars and $5 for motorcycles. Buses, RV's, and Trailers are not allowed. Beach and Bathhouse hours are from 9am or 10am until 5pm, weather permitting, from June through September or Labor Day. Children under 6 must be accompanied by an adult. Please obey the Lifeguards and Park Personnel. They have the right to remove offenders. Help keep your park clean! The beach is handicap accessible. There are picnic tables scattered around the lawn area of the park. There are no charcoal grills provided. Sometime in the late 1970s, the two central jetties (simple structures made of iron rails, encased in wood, and weighted down with sandbags) were removed. A much longer and wider permanent cement and stone jetty replaced the third jetty (which also had been cement and rocks, but shorter and flimsier) along the Weirs channel. Eventually, all the sand at the north end of the beach migrated south, towards the channel. The result is the wide, beautiful crescent beach of today. Here is an early 1950's photo showing the second jetty in profile. 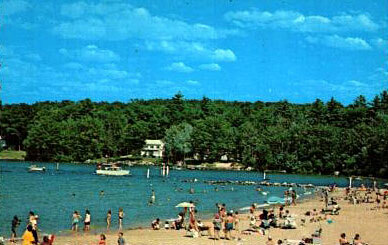 At this time, the beach had only been built about halfway towards the Weirs Channel. Click here to enlarge. An aerial photo from 1952 shows that the beach was also being built from the opposite direction (from the Channel northward), leaving a gap in the middle, which is what we see in the foreground above. 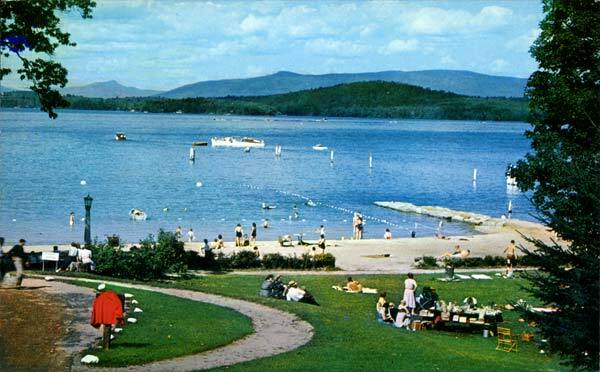 The reason for the gap was that the northern, municipal section of the beach was owned by the City of Laconia while the southern, Endicott Rock Park section was owned by the state of NH. 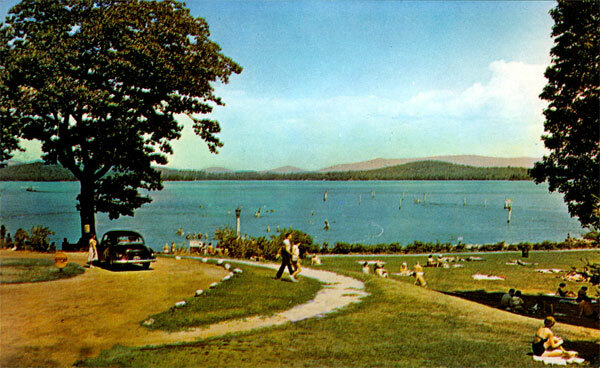 (In 1952 the city purchased Endicott Rock Park from the state.) According to a December 20, 1952 Citizen article, "Captain Edward Lavallee is piping sand from the channel to fill the short stretch of land between the two. 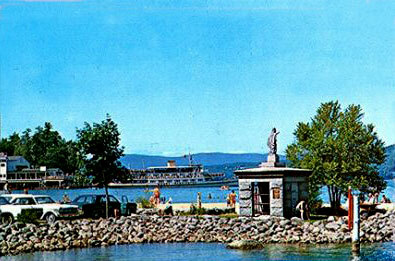 Captain Lavallee constructed the municipal beach in 1950 with his suction dredge equipment. Captain Lavalle will move 1800 cubic yards of sand from the channel for $1 a yard." Captain Lavalle was the long-time skipper of the Uncle Sam mailboat. He died on January 24, 1984, at the age of 92. 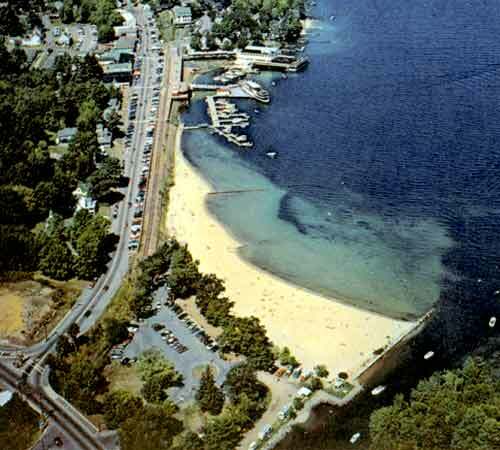 Compare the two aerial photos below to see Weirs Beach before and after the addition of the beach. The first, the black and white aerial, appeared in an ad sponsored by the Weirs Chamber of Commerce in a 1949 promotional brochure. 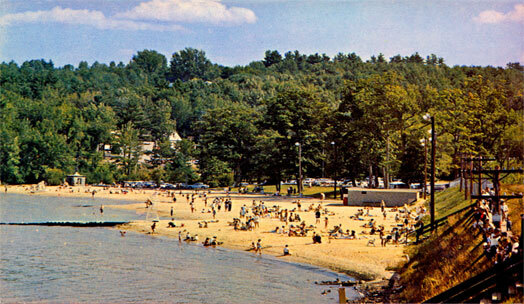 The second, a color aerial from 1960, shows an identical view, with a brand new, big, beautiful beach. 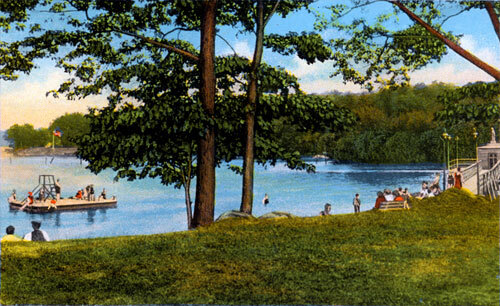 In May 1908 the Boston & Maine railroad donated the land for Endicott Rock park. 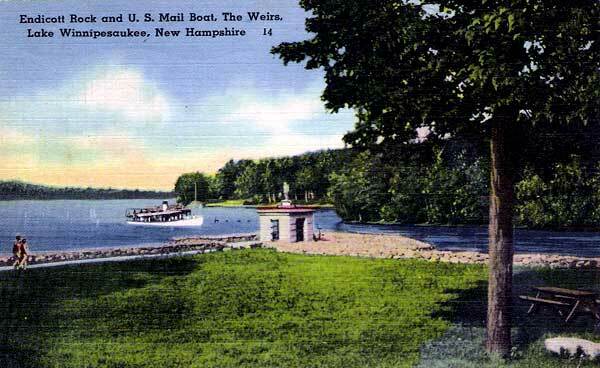 This postcard was postmarked in 1911. 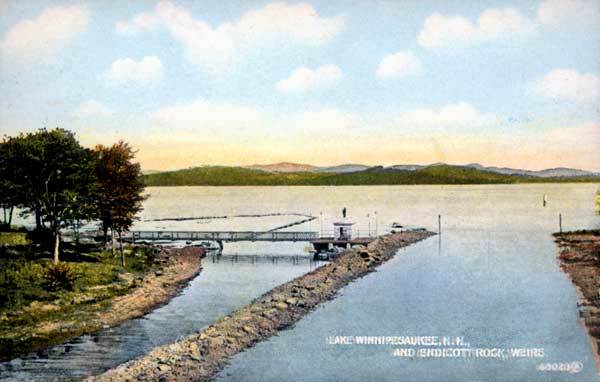 We see here that a breakwater had by this time already been constructed not only along the Weirs Channel, but also surrounding the swimming area. 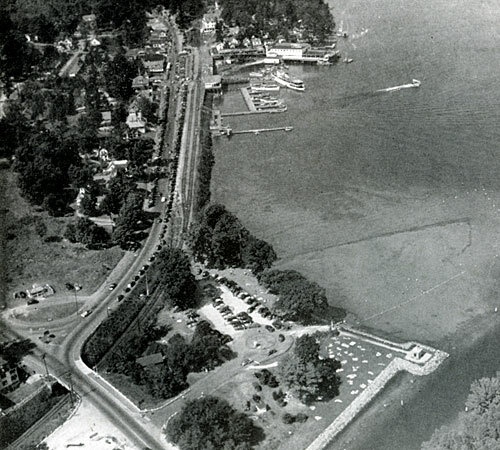 In the black and white aerial photo on the left we can still see the faint outlines of the swimming area breakwater, 40 years later. 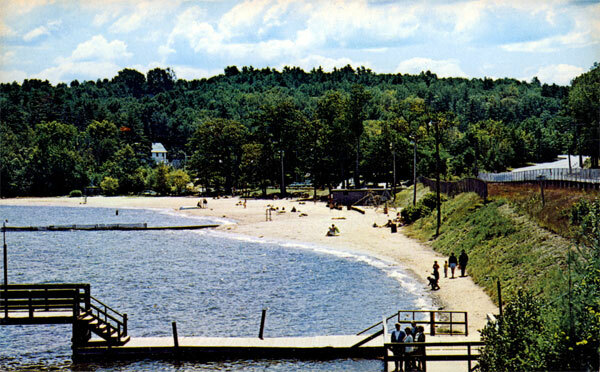 This circa-1962 photo also clearly shows how the beach used to extend all the way to the public docks. Click here to enlarge the photo and for additional info. 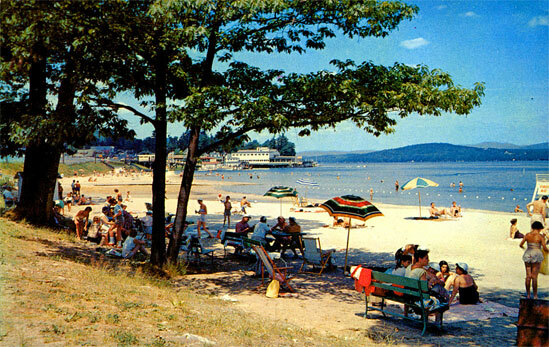 As is clear in the above photo, in 1960 the beach originally extended via a narrow strip all the way to the public docks. Mother nature and the forces of erosion have taken their toll over the intervening 40+ years; today, the beach only extends North to the second set of stairs leading to the beach from the public boardwalk. On the other hand, the southern end of the beach, where most of the sand has piled up against the long breakwater jetty along the Weirs Channel, is nicer than ever.